On 3rd July 2015, we went to CLASS Gorkha for Jasta Distribution Program. We distributed 27 Bundle Jasta. 20 Bundle for our supported kids and 7 bundle for single women, LSA and student family. All kids and their parents are involved in the program and they received Jasta. They were very happy and thankful to CPCS. On 4th July 2015, we went to CLASS Ramechhap for Jasta Distribution Program. We distributed 13 Bundle Jasta in CLASS Ramechhap. 12 Bundle for our supported kids and 1 bundle for LSA. 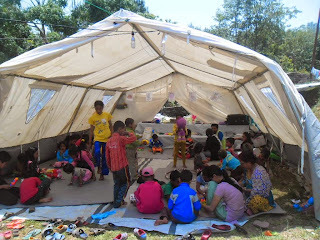 We provided 5 big tarpaulin for 5 school and 30 Pcs Dignity pack for the Supported kids mother and local women. 30 Pic mosquito net for supported kids. Their 30 kids are studying through our support. Our LSA (Sita) home is totally damaged. We distributed 12 bundle Jasta for kids family and 1 bundle for LSA. On 5th July 2015, we went to CLASS Sindhuli for Jasta Distribution Program. 27 Bundle Justa distributed in CLASS Sindhuli. 8 Pcs green tent and 50 Pcs mosquito net. 23 bundle for kids family , 2 bundle for single women , 1 bundle for LSA and 1 bundle for Hem sir. 8 Pic big tarpaulin provided to the school for TLC (Temporary Learning Center). In our program all local people , parents, municipality secretary and kids involved. Parents managed everything they count and separate and distributed Jasta and tent.